Do you want to install WordPress on your Windows computer locally? Working with WordPress on your computer allows you to test new WordPress features, learn how to develop with WordPress, and make websites before migrating them to the live server. 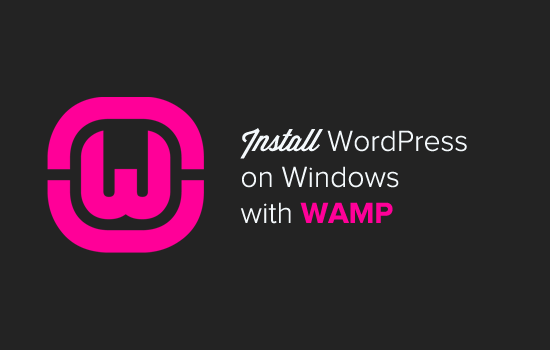 In this article, we will show you how to properly install WordPress on Windows using WAMP. Why You Should Install WordPress on Windows? Installing WordPress locally on your computer gives you a testing environment that doesn’t affect your live website or blog. A WordPress install on your computer is also referred to as local server or localhost. Normally WordPress developers use local WordPress install to develop their plugins and themes. Beginner users can also install WordPress on their computers to learn WordPress, test new WordPress theme and plugins, and experiment without affecting a live website. Note: If you install WordPress locally on Windows, then the only person who can see that site is you. If you want to make a website that is available to the public, then you need to have a domain name and web hosting. 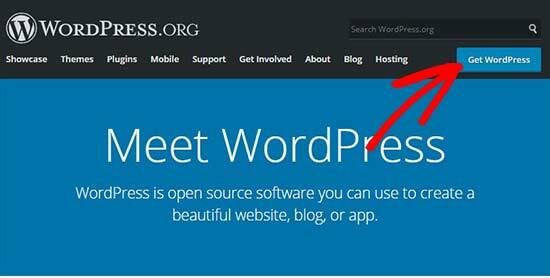 We recommend that you follow this guide on how to start a WordPress blog. 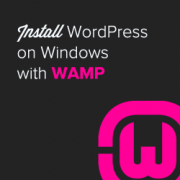 That being said, let’s take a look at how to properly install WordPress on Windows using WAMP. WAMP, is a compilation of Apache web server, PHP and MySQL bundled for Windows computers. All of them are separate open source software. However, installing them separately is not quite easy even for experienced users. Software like WAMP allow you to easily install them and have a working local environment within minutes. First, you need to download the WAMP software and install it on your computer. Simply go to the WampServer website and click on the ‘Start Using WampServer’ button. It will take you to the downloads section. You’ll see two versions here: WampServer 32 bits and WampServer 64 bits. You need to select the WampServer version that matches the operating system type of your Windows computer. 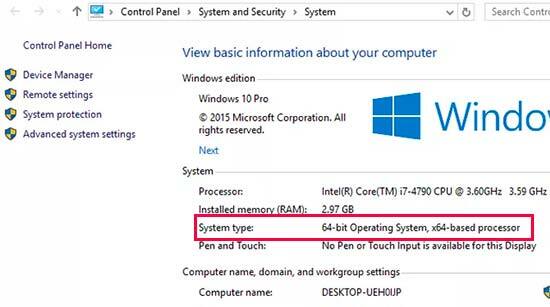 To find out whether you are using 32 or 64-bit operating system, go to Control Panel » System and Security » System in your computer. There you will be able to see your operating system type. Once downloaded, you can click on the wampserver execution file to run the installation. Make sure that you carefully follow the instructions on the installation screen. During the installation process, you need to define the location for the web browser. By default, it will be Internet Explorer. You can change that to Google Chrome or any other web browser by locating it in the Program Files of your computer. 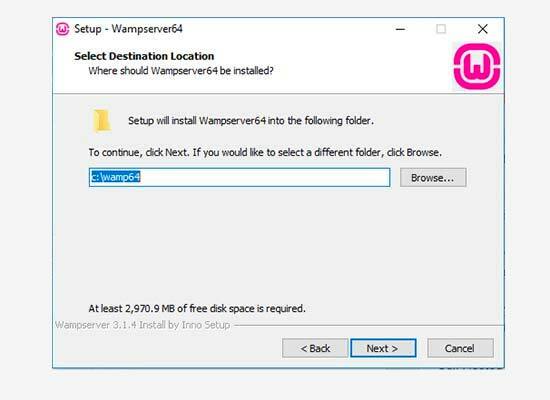 Once installed, you can launch the WampServer to continue. Next thing you need to do is to create a blank MySQL database. On launching WAMP, you’ll see a green WampServer icon at the bottom right corner of your screen along with other icons. 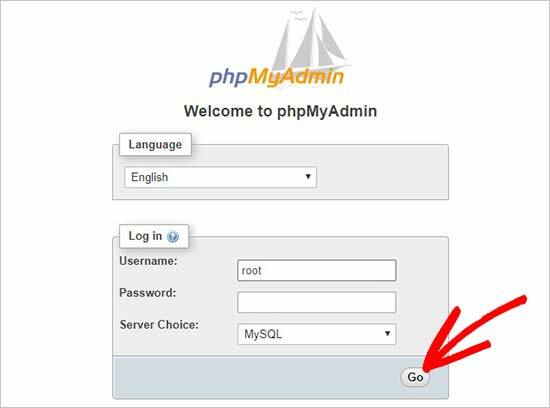 Simply click on it and then click on phpMyAdmin (a web based application to manage MySQL databases). Note: If the WampServer icon is red or yellow, then it means the services (Apache, MySQL, PHP) are not running. You need to start the services by clicking on the icon before setting up the database. It will take you to the phpMyAdmin login screen on your web browser. Simply enter the username: root and leave the password field blank. These are the default credentials to login into your localhost phpMyAdmin. Click on the ‘Go’ button to continue. Once logged in, you need to click on Databases in phpmMyAdmin to create a new database for WordPress. It will ask you to choose a name for your new database (we named ours test_db). After that click on the ‘Create’ button. Your database is ready which means you can now install WordPress on localhost. The next thing you need to do is download the latest version of WordPress from the WordPress.org website. It will download as a zip file. You need to extract the zip file and copy the ‘wordpress’ folder. Now you need to navigate to the folder where you installed WAMP. In this tutorial, we installed WAMP in C:\wamp64, so we’ll refer to that folder going forward. But keep in mind, it may be different for you depending on where you installed the program. Paste the ‘wordpress’ folder into the C:\wamp64\www folder. You can rename the ‘wordpress’ folder to anything you want, such as mysite, testsite, etc. This will be the URL of your local WordPress site, so be sure to choose something you’ll remember easily. For the sake of this tutorial, we renamed the folder from wordpress to mysite. First, it’ll ask you to select a language and then show you the database setup information. Once you have read it carefully, go ahead and click on the ‘Let’s go’ button to continue. After that, you need to enter your database details like database name, username, password, host, and table prefix. The database name will be the one that you entered in the previous step. In our case, we called it ‘test_db’. The username will be ‘root’, and you can leave the password field blank. You can also leave the database host and table prefix as-is. Next, click on the ‘Submit’ button and WordPress will create a configuration file for you in the backend. 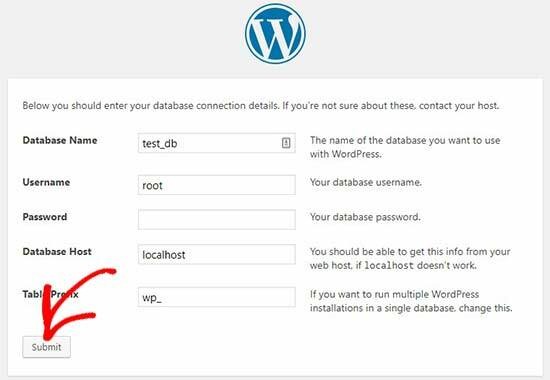 On the next screen, you will see a success message stating that WordPress is connected to your database, and you can proceed with the installation. Go ahead and click on the ‘Run the installation’ button to continue. It will take you to the welcome screen for WordPress. 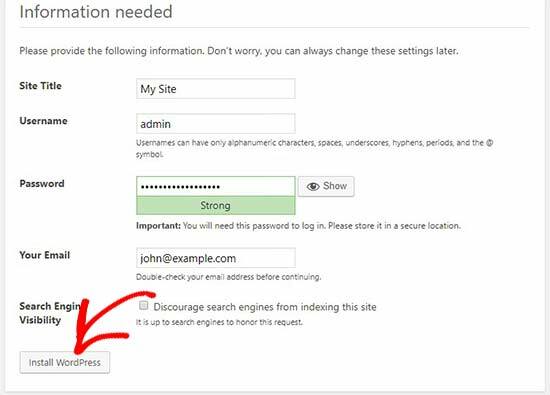 You need to add a title for your new WordPress website, choose an admin username, enter a strong password, and provide an admin email address. Once you’re ready, click on the ‘Install WordPress’ button. After the installation process is complete, you’ll see a success message. In the background, WordPress has created new tables in your database and it’s ready to use. You can then proceed to your WordPress dashboard by clicking on the ‘Log In’ button. Congratulations, you have successfully installed WordPress on a Windows computer using WAMP. The new version of WordPress doesn’t break your local site on changing the permalinks setting. However if you still see the ‘page not found’ error on your pages after changing the permalinks from Settings » Permalinks in WordPress, then simply follow our guide on how to enable custom permalinks in WAMP. WAMP is quite easy to use even for beginners. However, if you are unable to get it running, then the following troubleshooting tips would help. If you have Skype installed and running, then WampServer may not be able to work properly due to a conflict with Skype. The conflict is caused by both Apache and Skype using the same port 80. There is a simple fix for this problem. Open Skype and go to Tools » Options. This will bring up a dialog box, from here you need to click on Advanced and then Connections. Uncheck the box that says Use port 80 and 443 as alternatives for incoming connections. Save options and restart Skype. WAMP needs Visual C++ Redistributable for Visual Studio 2012 to run. If you don’t have it installed on your computer, then you can download and install it from the Microsoft website. We’ve also written a separate guide on how to move WordPress from WAMP local server to a live site. Hopefully, you’ll find it helpful when you are ready to deploy your local site to production. Having a local server environment is great for learning and testing purposes. But remember, if you want to start a WordPress blog for other people to see, then you do not need to install WordPress on your computer. You need to install WordPress on a WordPress hosting provider. 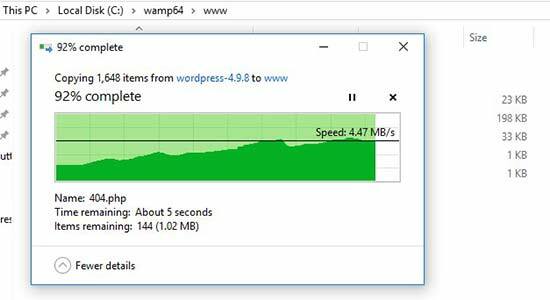 We hope this article helped you learn how to install WordPress on Windows using WAMP. 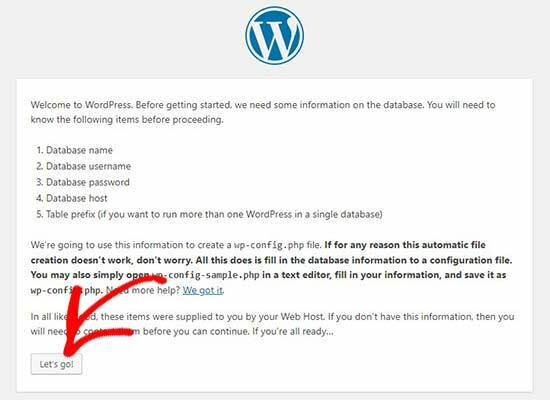 You may also want to see our guide on 18 most important things you need to do after installing WordPress. Thanks a lot for such a wonderful post. Just to say Thank you very much. thank you…thank you soooooooooooo much ..
Help please! I have followed the article and installed wamp, created the wp database but culd not be able to run complete configuration of wp. Its telling me “can’t select database”. Try Again. Please help me to fix this. Thanks. During the installation when it asks for your database details, please make sure that you are entering the same name for the database which you used when creating database in phpmyadmin. For username, use root and leave password blank. Just a quick note of thanks for this very simple-to-follow tutorial. It worked like a charm (including the Apache rewrite for permalinks follow-up). We always recommend using the latest stable version of WordPress. as I am unable to run the WAMP Server on Windos 8. Please read question posted on 12/11/13. I was able to install WP, but I’d like to know how to manage different web logs within my local server. Thank you for the instructions and tutorials here. After entering details for Site Title, Username, Password and Email I press Install WordPress and my computer hangs. Please help. This could happen for a number of reasons. Try to uninstall wampserver and then download and reinstall again. If the problem presists, then you can try XAMPP. and no other conflicting apps. I need some help to fix this issue. Any ideas? Thank you in advance. Thank you very much for this site. I am new to WordPress and found your tutorials and explanation very good and straight forward. I feel that you are a busy man but still have time to dedicate this site to new WP beginners. God bless your parents. Hey i have the same problem, so if i just copy all the files to a subdirectory it will work or do i have to reinstall it all over? Thanks. Thank you, than you, thank you. I am a technophobe and your clear instructions helped me all the way. 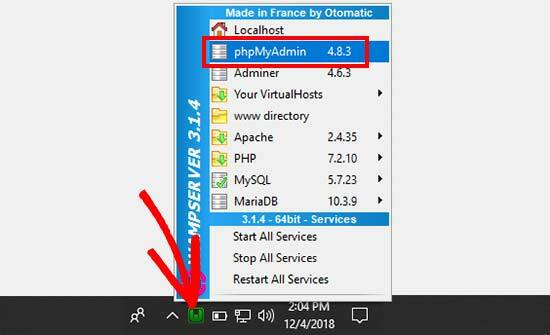 Try restarting all services make sure that WAMPServer icon is green also make sure that Skype is not running in the background. Also look at this support thread for more possible solutions. Thanks a lot: I followed your recommended thread and I removed a double line in the Host file (‘127.0.0.1 Localhost’) that seemed too much and now I can get to a log-in page of phpMyAdmin, which is great, but I have not yet even entered an ID and password during initial installation of WAMP. Did I miss something ? To log in to phpMyAdmin, enter username root and leave password blank. Can I run more than 1 test site on WAMP? and any ideas of how I would go about this please? in your www directory create new directories for each website. That way you can run multiple sites on localhost. you are probably entering wrong credentials to connect to your mysql database. Hi. I am a new-bee to this world of eb designing. Wanted Joomla but that didnot go thru too well. WP instal was as good for me. Thank you. XOXOXO. Hello. I want to be able to develop my wordpress site locally and not have to be connected to the web when I make changes and do save or update inside wordpress. Before I go through all the installation of WAMP and WP locally, can anyone tell me if I will have to have internet access to make updates to a wordpress running locally in WAMP? Sure I realize if I wanted a new Theme or Plugin, I would have to be online, but if I am just making adjustments to text and adding pictures that are already on my laptop, etc. will I have to have internet access to do so? I ask because I do a lot of travel where I am on an airplane and could be working on a new version of a website if I don’t have to be online. Also, I can’t afford a wireless account for my laptop, so I only have internet when I am at home with my own wifi or when I am somewhere that has a free wifi. Thanks. no you do not need an internet connection to work locally on your website. I followed the instructions to the letter, installed WAMP and the required SP1 Visual C++ on a brand new laptop running Windows 8 64bit. The installation refuses to launch, brings up a screen asking if I’m sure I want to let this programme make changes to the computer, then does nothing when ‘Yes’ is clicked. What is going wrong? Does the wampserver icon appear in your windows taskbar? If it does, then you need to click it and launch wampserver. Please help. I installed WAMP but when I went to open phphMyAdmin, nothing happens. I tried uninstalling and reinstalling, but still getting the same problem. I’m not even getting any sort of popup block notification in my browser. Just nothing. I wonder if this might have something to do with the WARNING window that popped up on the WAMP website before I downloaded it… It said something in French, and then something about needing to install C++ which I know nothing about, and which was not mentioned in this tutorial. Do I need to install C++ and if so, do I need to learn how to use the programming language before I can finish this tutorial on installing WordPress? I am a designer, not a programmer, so I hope to god I don’t need to stop everything and go learn C++ before I can do a simple WordPress install. Brynn you can always check whether or not Microsoft Visual C++ is installed on your computer from Control Panel -> Programs and Features. 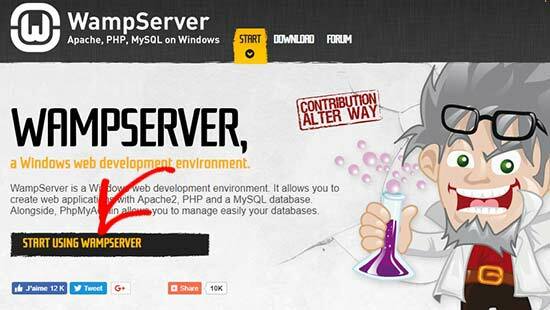 Do you see wampserver page when you visit http://localhost? If you do, then you have already successfully installed WAMP. Can I hug you now or later? I install wordpress to my localhost. But i dont know to use it to develop a site. I’m new to wordpress. Please anyone help me. Take a look at our beginner’s guide section. For theme development you may want to take a look at our WordPress theme cheat sheet for beginners. Can anyone point me in the right direction as to what this is and how to fix it? I don’t know if this makes a difference but I have it installed on my secondary hard drive, not my C drive (the c drive just has my operating system). If using Skype, go to Tools->Options->Advanced->Connection and uncheck the box “Use 80 and 443 as alternatives for incoming connections”. Restart Skype after WAMP. Now you will be able to use both programs at the same time w/o problems. Lets see now how much it helps me. I m here for all the support that i can extend. Thanks to the author of this page. Problem solved – I had needed to install the Visual C# redistributable, and did that after installing Winamp. Uninstalled Winamp, rebooted and then re-installed – everything fine. That’ll be user error then ! ! ! I’m getting the same error you just described below, where is this redistributable you speak of? I’ve just downloaded and installed WAMP and have got to the “set up a database” stage. When I select ‘phpMyAdmin’ I get a ‘Firefox Problem Loading Page’ page with “Unable to connect – Firefox can’t establish a connection to the server at localhost”. I’ve tried the fix suggested by Imran on June 17th, but this doesn’t seem to have fixed resolved the problem. Any thoughts on how I fix this, please?? Do you have a tutorial that is the reverse process also using WAMP? I have a functioning website that I would like to duplicate on my home computer for experimenting and learning css, and php programming without risking my functional website. Hi, a very useful article, thanks. Is it easy to migrate a test WP site on WAMP to a hosted site elsewhere? Do you have a tutorial article to help? Great! How timely! Thanks guys, looking forward to it. Absolutely cracking article – really helpful, thanks so much! i am getting redirected to directly php my admin webpage and not the database entry option which is shown above. thereafter the details are not matching afterwards in database,username and password.please give me its solution as soon as psbl. Click on the Go button. You will be directed to the page you are looking for. Hi! Once I’ve created a site on my WAMP server, could I then transfer it to an existing domain name? I’m trying to create a new site without shutting down the old one. Once the new one is finished, I would want to replace the old one, but use the same domain name. Thank you! Yes you can do that. We have updated the article to add a link to the tutorial. Hi, I am having trouble with links not working. Could you help me or give me some direction on how to fix that? On my site “chrisjamesmedia.com” click menu, then “blog” and i get “not found”. This also happens with links as well. Also, do you have a tutorial on how to host multiple domains from this as well, or point me in the right direction.? I have looked up several things about virtual domain, localhost, and everytime I find something they want me to edit httpd conf, but what they have doesnt match mine. Great article, very clearly explained. Would you be able to tell me the best way to add a second WordPress site to Wamp? I have read a lot of conflicting information and would rather not make a massive mess of things! Create a new folder inside your www folder, then repeat this process. Thank you for providing this excellent tutorial! It’s going to be great to get use to using WP onn my PC before I install it on my host server and create my website. I followed your instructions and installed WAMP and then WordPress and got all the screens you showed here… and with the tweaking you suggested, I was finally able to open WP – saw the Dashboard, etc. Then I closed it. But now I can’t seem to open WP. I open WAMP and click on Localhost – and it just sits “waiting for response from localhost” – does not open anything. I’ve tried http://localhost/my database name – it will not open – I get “HTTP 500 Internal Server Error”. 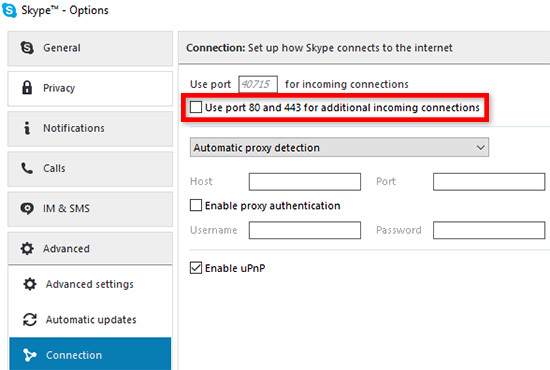 Just in case, I also followed your instructions on SKYPE and unchecked that Port 80 box. Did you shut down your computer? You have to launch WAMP Server every time you restart your computer. You don’t have permission to access /phpmyadmin/ on this server. what is the reason ? can you please guide me. thank you in advance…. That’s weird. Since you are the admin of your Wamp install, then you shouldn’t get this error. I think it will be useful for others. Goto c : wamp/alias/phpmyadmin.conf file, open with notepad. Thank you very much EDITORIAL STAFF, this is a nice post and very usefull. I can get to the WP install screen from 127.0.0.1, but not localhost. I’m running Windows 8. Any ideas on how to get this to install? Thanks in advance for any help you might be able to give me. I wanted to use this method to test out plugins before installing then on my live site. So in your tutorial, instead of copying in clean WordPress files, I copied in a full backup of my site made using BackupBuddy. However from this point on I’m not sure what to modify in order for my site to function correctly offline. I edited my wp-config file to the new database details, and imported my database from my online phpmyadmin to the WAMP one. However it seems like there’s something I’m missing, as when I try to access localhost/site/wp-admin I am redirected to my online login page. I’m in the same boat – did you ever find a solutions? Another (lazy) point for XAMPP : I know there are some differences in the config files, but I use both linux (at home) and Windows (Seven and 8) at work, so I appreciate having the same interface for I only have to learn once. Great article and easy instructions for those who want to venture into WAMPP….however, for myself, I still prefer XAMPP and do run it on it’s own on a second drive without the installable version. Updating is a breeze, although I rarely need to. I’ve used XAMPP for many years now for both WordPress and Joomla theme development, as well for a testing server. Never had issues and I do find it quite easy to use. I used to use the full version but I found that the Lite version works extremely well. I noticed someone said AMPPS, but I’ve never tried that…perhaps in my spare time I will try it out. Its click and install that’s how easy it is and just open to localhost/ampps i use it for all my scripts that this includes as downloads and install on the service. no worries on xamp and wamp that i found to limited in some ways. I’m a very beginner with WordPress and I have created a site with it and WAMP on my computer. Now I want to put it online, but I don’t know how to do it. Where does a tutorial exist for that? The thing is that I want to replace the current site, which is hosted somewhere else, and so keeping the domain name. Does anyone know where I can find this kind of information? WAMP in the older days was great! Now there is a far more better and less embarrassing way when it comes to configuring things with WAMP. WAMP is in the past and gone for me. I use AMPPS far more better no configurations, just install and a few dips of changes in the options section that’s it. Open your browser go to your localhost and install any cms or other scripting lang within your browser using ampps. You’ll be amazed! No more downloading then extracting in www folder and then reconfiguring. WordPress is just a click and install on ampps. No hassle! Shouldn’t you guys write something about AMPPS? This is a lot more better than WAMP! WAMP lags a lot of things like cgi and stuff those are extras, but on ampps everything is included. Ever since ampps I never looked back to wamp! Sorry! Have been using WAMP for so long that didn’t even bother with another option. AMPPS sure looks good. Good to see that it is made by the folks from Softaculous. Will have to give it a try. Thanks for the suggestion Nicholas. Why do you say you prefer WAMP over XAMPP? WAMP is much simpler and easier to use compared to XAMPP. Would second that. WAMP is easier to use. Several years ago when we used XAMPP the upgrade process was complicated and it was buggy. We switched over to WAMP and it was awesome. Hi, Thank you very much for this. It’s very informative and easy to follow. However I’d suggest you mention the skype thing a lil early around the localhost point, because, there ppl start to worry when they see a blank screen with skype on in their PC. Great post though. Keep it up. Just to mention, that Team Viewer also causes problems with WAMP. I actually do prefer XAMPP and DTX-Control for I can overcome security policy : Installation without administration rights (zip file pour the web server) and full access to blocked ports (80, 443, 3306). Get 60% off GreenGeeks WordPress Hosting and a Free Domain. Get 20% OFF on StartBooking online scheduling software.